Captain Jefferson Kyle Kidd travels through Texas, reading the news to crowds of people who long to know what is happening outside of their small towns. He finds purpose in this job, especially since his wife has died and his children live far away. When he is asked to transport a young girl to her relatives, he is unsure what to do. Johanna was captured by a Kiowa tribe after they killed her parents and she has lived with them for four years. The US Army rescued the girl, but they need someone else to make sure she arrives safely to an aunt and uncle she does not remember. Captain Kidd and Johanna set off on a 400 mile journey, where they will encounter friends and enemies and forge an unexpected bond. So I think I read a Western and I really enjoyed it. News of the World has the requisite journeys over dangerous territory, tense shoot-outs, and encounters with hostile local tribes. But this story isn't really about who is the best shot; it's truly about the unexpected relationship between Captain Kidd and Johanna. He's an old man who has already raised a family and lived through the horrors of the Civil War. She's a child who has forgotten English, won't wear shoes, and certainly doesn't like or trust this strange man in a wagon. But Kidd is one of those wonderful characters who is determined to do the right thing, even when it's difficult. He is also a man who believes in the importance of story and the written word. He shares the news with people to make a living but, more than that, he tells stories because he knows that they can take you out of your circumstances and show just how big and wonderful the world can be. Paulette Jiles does an excellent job of bringing the South after the Civil War to life and showing the reader how complicated life could be. But she does this alongside beautiful descriptions and characters that grow on you with each page. This is one of those rare and wonderful books where you wish that the author had written several more to tell you the entire backstory of the characters and to give you entire novels centered on minor characters. I happen to have an extra copy of News of the World to send to your bookshelf. If you would like to win this book, leave a comment telling me the best Western or historical fiction novel you've read lately. I will pick a winner in one week. Difficult to pick just one book. For me its historical fiction which is my genre not westerns. This sounds like an interesting read. Thank you very much for sharing the news of the world as well as sharing the giveaway offer to make us able to have something good. Loved News of the World. It was one of my favorites last year. 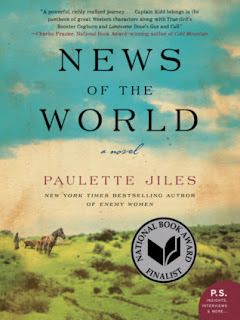 Loved News of the World - recommended it far and wide but don't actually have a copy (I read a library book) so I'll gladly enter your giveaway. Another excellent Western novel I'd highly recommend is The Power of the Dog by Thomas Savage - not widely known but it is first rate. "This is one of those rare and wonderful books where you wish that the author had written several more to tell you the entire backstory of the characters and to give you entire novels centered on minor characters." Yes yes yes!!! A rare book indeed, and I love it when I find a book like this.